Come promuovere una trasformazione dei conflitti positiva nelle società multiculturali, multietniche e multireligiose in contesto europeo, mediorientale e dell’Europa orientale? The main aim of the “Inventing the future” study was to promote positive conflict transformation in multicultural, multi-ethnic and multireligious contexts, through the use of an innovative approach: the reciprocal maieutical approach (RMA). Conflict transformation “includes bringing about a structural and relational change within the society to bring a halt to the existing conflict” (p. 51, Goswami, 2007). As affirmed by Lederach, it should have a focus on the active involvement of the people that live the conflict situation directly. The RMA method allows and allowed for this active participation. In fact, Reciprocal maieutic approach is a strategy of group communication that allows each person of a group to share his/her ideas and express opinions about a specific issue/theme/problem, contributing actively to the development of a common idea, decision and resolution. This method is a “…process of collective exploration that takes as a departure point the experience and the intuition of individuals” (Dolci, 1996) that was developed by Danilo Dolci, an Italian pacifist that came to Sicily in 1950 and had an important role in fighting against mafia and for the rights of poor people in the area of Trappeto and Partinico (Palermo). 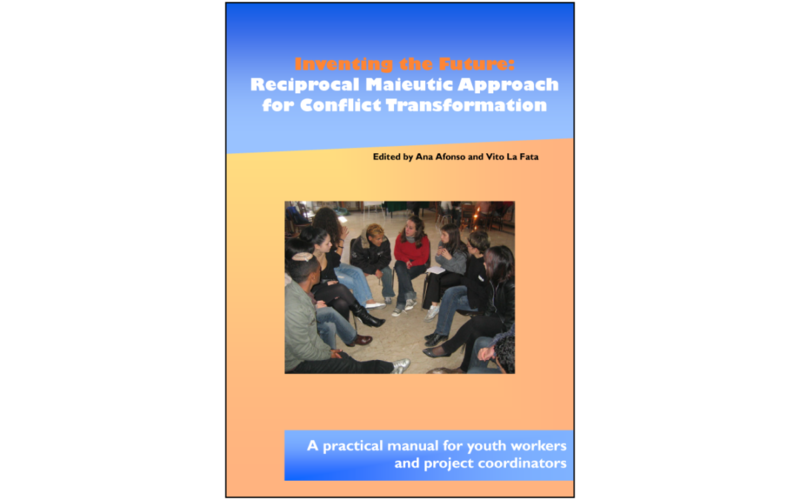 The “Inventing the future” study demonstrated how the RMA method can be used effectively by youth workers in their work with youth in a context of conflict and where the aim is to achieve conflict transformation. The RMA workshops involved 60 youths and 20 youth workers from seven different countries in Europe, Eastern Europe and the Middle East (Italy, France, Spain, Bulgaria, Moldova, Palestine and Israel), who applied this method to nonviolent conflict transformation as well as in non-formal education processes. Back in 2006, in the above-mentioned countries there was a growing need of developing strong educational structures and activities through which young people could learn the fundamental values of life, the skills and competencies to communicate and act in a context of diversity and the way to become an active citizen. Factors like wide migration fluxes, globalization of the economy, easier access to information, etc., contributed to the level of diversity in the modern multicoloured and multitextured mosaic-like societies. Such societies were and still are often a challenge for young people, who needed to acquire intercultural skills and coexist with diversity, that sometimes sadly exploded in violent conflict (as in France’s “La crise des banlieues”) or that became more and more difficult to sustain with nonviolent peace support operations. As part of the study, all partners identified the main conflict in their local community and recruited a group of 10 youths coming from the conflicting parts identified. The programme of activities was common to all partners and a coordinator and 2 youth workers in each country facilitated the implementation of the programme and guided the youth group. This programme was thought of and designed in the framework of reciprocal RMA, non-formal education and international mobility and it happened at two levels, local and international. Participants in the RMA workshops helped individuals to share different points of view with other people; to learn to communicate in a nonviolent way; develop listening and verbal communication skills; to learn to value and respect others; learn to value the group and to cooperate; develop active participation awareness and skills; to strengthen democratic competences; to facilitate and reinforce the integration between people from different backgrounds; to help young people to develop the skills and competencies to deal in nonviolent way with conflict situations in their multicultural, multi-ethnic and multi-faith contexts and in general; and ultimately to promote positive change in the life of young people and communities where conflict emerged. Gender mainstreaming in peace support operations: Moving beyond rhetoric to practice (p. 7). International Alert. July 2002. This is a document produced by all youth participants in the project. They were interviewed concerning the theme of violence and conflict and a final summary was created considering all the opinions and ideas expressed by youth. This Manual gives an overview of the project ‘Inventing the Future’, also with some reccomendations that were developed based on our project experience. It is also possible to read and understand about the main method of the projetc, the Reciprocal Maieutic Approach (RMA).